Korea’s diva Insooni is certainly a multitasker. And an amazing one. Dressed in a chic black and white print dress with a her trademark hairstyle of puffy white top and closely shaved sides, Insooni seemed rather relaxed despite what must be a very hectic schedule. “All the good opportunities always come at once,” Insooni told reporters at a press meeting in Jamsil, southern Seoul, Wednesday. “Cats,” which celebrates its 30th anniversary this year, is the second longest-running show in Broadway history. Based on “Old Possum’s Book of Practical Cats” by T.S. Eliot, the musical was first performed in Korea in 1994, and was a hit in 2003, 2007 and 2008. Its famous song, “Memory,” is one of the highly anticipated numbers of the upcoming show. For Insooni, this is her second musical ever ― she performed in “Chicago” in 2009. But her music career goes all the way back to 1978, the year she debuted. Her character Grizabella is a very old cat who used to be carefree, proud and flamboyant. When she was young and beautiful, Grizabella left her home tribe to explore the outside world ― knowing that she would never be allowed back. She tries to reconcile with the people she left, asking for their acceptance once again. “To be honest, I thought I’d just have to sing the famous song ‘Memory,’” Insooni said. Having to sing in a heavy costume and makeup, Insooni said there are some challenges that she didn’t expect. When asked about how she manages to do so many things at once, Insooni said she is naturally physically strong and it helps her to do everything she does. Sharing her role as “Grizabella” are musical actresses Hong Ji-min and Park Hae-mi. While Hong said her youth and diligence are her forte, Park said it is her “inner sexiness” that she thinks will wow the audience. Insooni’s enthusiasm and positive spirit has been very inspirational during the practice sessions, the two actresses said. 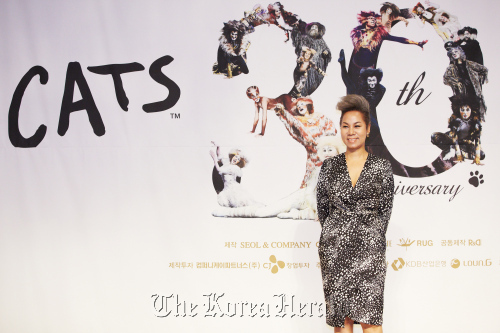 “Cats” runs from Sept. 17 till Dec. 31 at Charlotte Theater in Jamsil, southern Seoul. Tickets range from 50,000 won to 120,000 won. For more information, call (02) 1577-3363 or visit www.musicalcats.co.kr.